Yet day-to-day trading activities sometimes don’t create enough opportunity to wash out gains, especially when portfolio turnover is high. In fact, if a portfolio manager must rebalance on a particular date, she runs the risk that no client will choose to redeem shares that day. Given that many funds have minimal or sporadic redemptions, it’s a miracle that most high-turnover ETFs don’t distribute capital gains. Actually, it's better than a miracle. It's an anonymous, unheralded act of generosity. Behind the scenes, someone provides short-term capital to fund share creations in ETFs slated to rebalance their portfolios. The capital is required for less than a week, and often for just one to three business days. The capital can be returned as soon as those shares are redeemed. This short-term access to capital allows ETF portfolio managers to essentially manufacture redemptions that wash out capital gains that would otherwise be realized in a rebalance. VanEck Vectors Morningstar Wide Moat ETF's (MOAT-US) three year flows chart shows a healthy-looking pattern of huge inflows and matching outflows two business days later. 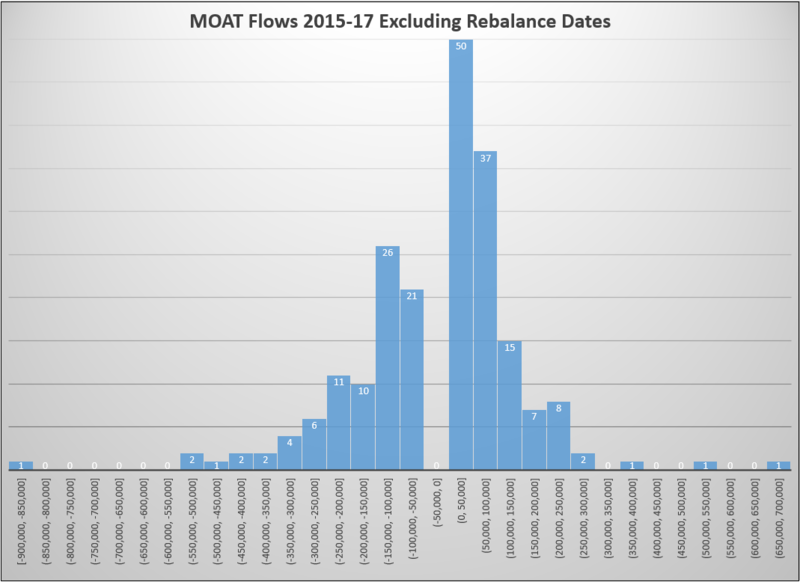 Since January 1, 2015, MOAT has had flows—in or out—207 times, excluding rebalance days. The most common was a single creation unit, or 50,000 shares. Outflows were rarely bigger than 200,000 shares. By contrast, here are flows from rebalance weeks in 2015-17. Shares created and redeemed range from 1 million to 9 million, dwarfing the day-to-day flows. The pattern is clear: inflows a few trading days ahead of time, outflows on rebalance Monday. The benefit is enormous: MOAT turned over 25% of its portfolio in the September 2017 rebalance. The realized gains could be significant, especially in the current hot equity market. That could make for a hefty tax bill come year end, an unhappy holiday gift. Somehow, someone created 4.5 million shares on September 14, a 14% increase in shares outstanding. While we cannot know the exact source of the creation, the pattern of outsized creations and redemptions above suggests that MOAT’s portfolio manager could count on a 4.5 million share redemption on rebalance day. That’s a huge opportunity to in-kind away low-basis stock, at no cost to the fund holders. I wish I knew who created and redeemed those shares, and how that transaction was funded, if only to offer thanks on behalf of MOAT’s longer-term shareholders. MOAT is hardly the only fund to display the “heartbeat” flows pattern. Other prominent funds with a similar pattern include PowerShares S&P 500 Low Volatility Portfolio (SPLV-US), First Trust Morningstar Dividend Leaders Index Fund (FDL-US), and Vanguard Russell 1000 Value ETF (VONV-US). VanEck is but one of many issuers whose rebalance date fund flows look like an EKG. When I looked for funds with outsized, quick turnaround flows repeated at intervals, I found examples at nearly every large ETF issuer, and many smaller ones, sometimes for nearly every fund and sometimes used quite selectively. The common thread was high-turnover portfolios, mostly in smart beta products, but also those with equal-weighting and active management, even vanilla funds benefit sometimes. Indeed, it looks like Vanguard Total Stock Market (VTI-US) experienced a large, quick inflow and outflow in the third week of March and June 2017, on dates that match its underlying index’s rebalancing window. 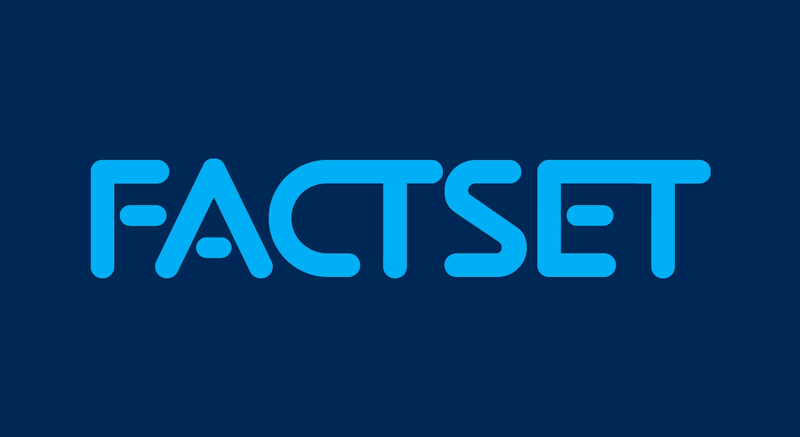 VTI rebalanced approximately 1.2% of its portfolio in June 2017 (weight based on a comparison of FactSet’s daily ETF holdings data for May 31 and June 30, 2017). VTI had an abnormally large inflow of 10.2 million shares on June 13, coupled with an outflow of 10.4 million shares on June 19. Those 10.2 million shares are about 1.6% of VTI’s ETF shares outstanding, though VTI’s portfolio is mostly held in mutual fund format (about 7/8 of VTI’s portfolio by dollar value was held via mutual fund share classes as of October 31). Here are what VTI’s flows looked like YTD as of December 12. If VTI—one of the lowest-turnover ETFs in the entire US ETF landscape—takes advantage of well-timed inflows and outflows, it’s a clear sign that virtually any ETF would benefit from this practice. Of course, some funds have tremendous turnover in shares outstanding, because of active trading that leads to daily creations and redemptions. The Technology Select Sector SPDR Fund (XLK-US) is a great example, with 100 days of net redemptions year-to-date through December 6. Low portfolio turnover coupled with consistent redemption activity allows many opportunities for washing out low-basis positions. Bottom line, if you are looking for effective tax management in an ETF, look at the flows chart. If you see oscillations, like in XLK, or if the chart looks like an EKG, your funds are likely in good shape, thanks to the behind-the scenes heartbeat of well-timed creations and redemptions.